The University of British Columbia's Global Health Initiative has been working closely with the Rinchen Zangpo Society for Spiti Development since 2006, improving the health of children at Munsel-ling School. Teams of doctors, nurses and other health specialists visit the school every summer and their contribution to our society has been immense. Please visit their website at, globalhealth.med.ubc.ca, or click here to read about their work in Spiti. Many of our projects have been made possible by direct funding from the Vancouver-based Trans-Himalayan AidSociety. They have also connected us to other organizations who have helped our educational programme to flourish. TRAS is an international development organization which seeks to improve the health and education of children and youth in northern India, Nepal and Tibet. Those in Canada who wish to make a donation to the Rinchen Zangpo Society for Spiti Development can do so through TRAS and be eligible for a tax-deductible credit. You can visit their website at www.tras.ca. 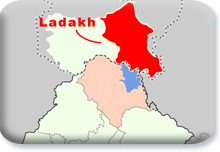 Ladakh lies to the north of Spiti. 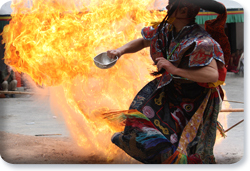 The people are similar in culture, being Tibetan speaking and mostly Buddhist. Two passes make possible an adventurous trek from Spiti to Ladakh's eastern plateau. In summer even now the occasional trader takes a selection of Spiti's slim but hardy horses over the pass to sell to Ladakhi nomads. 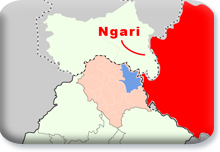 Ngari is the region of Tibet that borders Spiti to the east. Formerly Spiti was part of the ancient western kingdom of Guge centred on Tholing and Tsaparang. 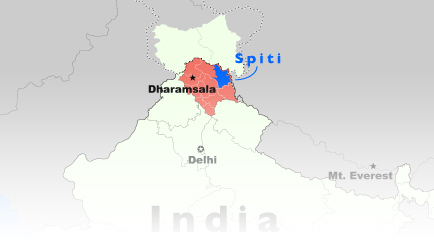 Some Spiti folk still have relatives in that part of Tibet. Marriage between the two communities took place until the Chinese invaded Tibet and sealed the border in 1959. 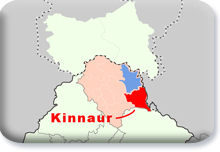 South-east of Spiti is the district of Kinnaur. The powerful Sutlej river which begins on the slopes of Mount Kailash cuts a deep gorge all the way through the Himalayas. Kinnauri villages perch on the slopes of this tremendous valley system amidst apple and apricot orchards. 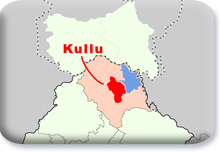 Kullu lies across the mountains to the south of Spiti. It receives the monsoon rains that cannot reach over the heights to Spiti and so it is a verdant land. The summer route to Spiti climbs through this holiday-makers paradise eventually to the top of Rohtang Pass. 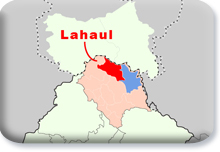 Lahaul neighbours Spiti to the west. It is accessed from the south over the Rohtang Pass. As in Spiti, communications with the outside world are difficult, especially in winter. Being at a lower altitude it has a greater variety of crops. Seed potatoes are a major one.